Alfie May celebrates scoring against Chorley. Barring a footballing miracle, it’s pretty safe to say that Doncaster Rovers will not win the FA Cup this season. 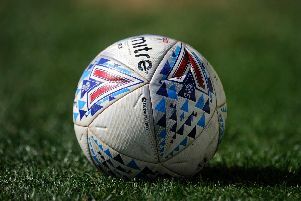 But that does not lessen the importance of getting a good result – or at least a good performance – in this weekend’s second round tie at Charlton Athletic. For starters, Rovers rather owe the Addicks one after they failed to turn up at The Valley a few weeks ago. They have since turned a corner in the season and, ahead of some very winnable league games, it is crucial that Grant McCann’s men keep the momentum flowing. Charlton are a good side and there would be no disgrace in losing on Saturday. But, whatever the outcome, Rovers must give a much better account of themselves than they did in the 2-0 defeat at the start of this month. A place in the third round and a potentially lucrative tie could also have a big impact on what the club are able to do in the January transfer window. And it would compensate for what has so far been a disappointing season in the cup competitions following a first round exit in the Carabao Cup and rather embarrassing demise in the Checkatrade Trophy group stages. To a certain extent the pressure is off Rovers’ players this weekend – unlike the previous round against Chorley. But a positive performance and/or result can only help their top six ambitions.